Produced by a fourth generation family-owned business using a unique breed of pig, reared in the north of Italy on a selected diet of cereals and grains. They select the finest whole legs of pork and cure them in pure sea salt, using only enough to preserve the meat. By the end of the process the ham has lost more than a third of its weight, helping to concentrate the flavour. The meat becomes tender and the distinctive aroma and flavour of Parma ham emerge. Serving suggestion: to appreciate the full flavour of this ham, please remove the pack from the refrigerator and open 30 minutes before serving. Waitrose have selected assured farms in Italy demonstrating exemplary standards of animal welfare and traceability. 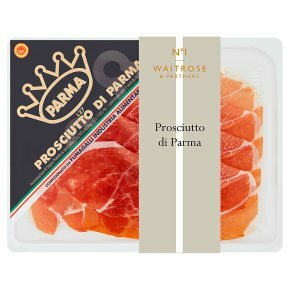 Our Parma ham is produced by a fourth generation family-owned business using a unique breed of pig, reared in the North of Italy on a selected diet of cereals and grains. They select the finest whole legs of pork, and cure them in pure sea salt, using only enough to preserve the meat. By the end of the process, the ham has lost more than a quarter of its weight, helping to concentrate the flavour. The meat becomes tender and the distinctive aroma and flavour of Parma ham emerge. Waitrose have selected assured farms in Italy demonstrating exemplary standards of animal welfare and traceability. To appreciate the full flavour of this ham, please remove the pack from the refrigerator and open 30 minutes before serving.